After the riots in Cologne, the nazis have embarked into making a loud political statement and their marches have increased exponentially, in Germany. Probably they were encouraged by the political signal sent by the christian democrats marching together with the neo-nazis on November 9 in Erfurt too. They cancelled their march in Berlin on November 9, probably not to spoil the Wall celebrations, but antifa still had to battle them in Alexander Plaz. Their marches are spiralling. On November 17, in Dresden 3,200 nazis marched opposed by 650 antifascists; in Belin 400 nazis were rezisted by 300 antifa and in Buch 250 nazis were opposed by 200 antifa. In Dresden violence against antifascists was again common. The Berlin leader of the Neo-Nazi Party “NPD”, Sebastian Schmditke (middle) among other participants of the Anti-Asylum March. The Berlin vice leader of the Neo-Nazi Party “The Right”, Patrick Krüger shouts slogans, which were also heard during the Cologne nazi riots. Nazis also resumed their marches in the village of Rudolf Hess, Adolf Hitler’s deputy, to the horror of the locals who this time played them a prank. Without the nazis knowing each step they took, local companies donated for a fund to help nazis move away. Locals even offered them food, bananas, under a banner which mocked Hitler’s book: Mein Mampf (My food). But few are laughing at the resurgence of nazis, not only in Germany but in the rest of Europe too. They must have felt particularly encouraged when seeing western governments support nazis to state power positions – police, secret service, rada and even government – in Ukraine. In UK, Ukraine nazis have even been allowed to march to the memory of Wafen SS, but antifa in London organized a counter-demonstration. Antifa in UK are blocking nazis marches weekly and sometimes even daily alreay. After the war, UK welcomed some 8,000 Ukrainians who fought on the side of Hitler, among them even UPA war criminals. UK in particular supported the most fanatical and utterly fascist Ukrainian nationalists before the war, particularly because they were fascists, and after the war, Ukrainian Holocaust collaborators were protected by the British government under the pretext of collaborating against the Soviet Union. Similar with the situation of Ukraine, diaspora was instrumental in bringing to power a fascist in Romania: a candidate of a ghost-like Christian Liberal Alliance, won the presidential election. He is also the president of a group created by Hitler to help colonize the country during the second world war, when Romania was an ally to the nazis. Over the weekend, thousands of Polish nazis and nationalists have attacked the Russian Embassy in Warsaw, in a provocation coming from a NATO member country. In France, and Italy the nazis are constantly opposed too on the streets by mass demonstrations of locals and antifascist militants, every single week. Antifascists in France are mobilizing for a huge counter-demo against the Congress of Le Front National in less than a week. In Greece, police repressed again with sadistic brutality the demonstrations against the colonels’ junta, many antifa students were savagely beaten by riot cops. Nazis intend to expand their marketing rallies, another one is called for November 22 in Berlin (same day antifascists in France gather against Le Pen’s party). Nazis claim they oppose the islamists of ISIL, but actually profit from their terror as they use it to promote themselves. Actually they seem quite happy with being offered such a pretext to take the streets and promote their fascist ideology for white christian europe and to pledge more violence against refugees and workers who leave their homes under the capitalist and imperialist terror. In Germany, however, the nazis intent to get closer to the point of turning their marches into a snowball so large that it cannot be turned back. While antifascists are still beaten by cops – not surprising considering that some expose even on facebook their xenophobic views – , even when they are outnumbered by nazis who attack their own, the street demonstrations remain the only reliable weapon for antifascists. However, the nazis are getting even nastier. One of them tried to infiltrate and spy on antifascist circles in Munich but he was spotted on and unmasked. On November 15 in Wunsiedel he openly changed sides and held a banner of the nazi party The 3rd way. Some figures show how dramatic the situation really is, in fact. Street marches and rallies by nazis are just the tip of the iceberg. Right wing violence has increased in the past 10 years, there were 632 attacks, especially refugees fall victims of the nazi attacks. Antifa are working hard to expose and identify the nazis who participated at the rally in Hannoever, all their pics are posted on this site. Below are just some of them. These two, Brück and Drewer, were also in Hannover. Cops and nazis attacked jounalists and antifascists. As seen in this video, however, this cop actually sprays his colleague. 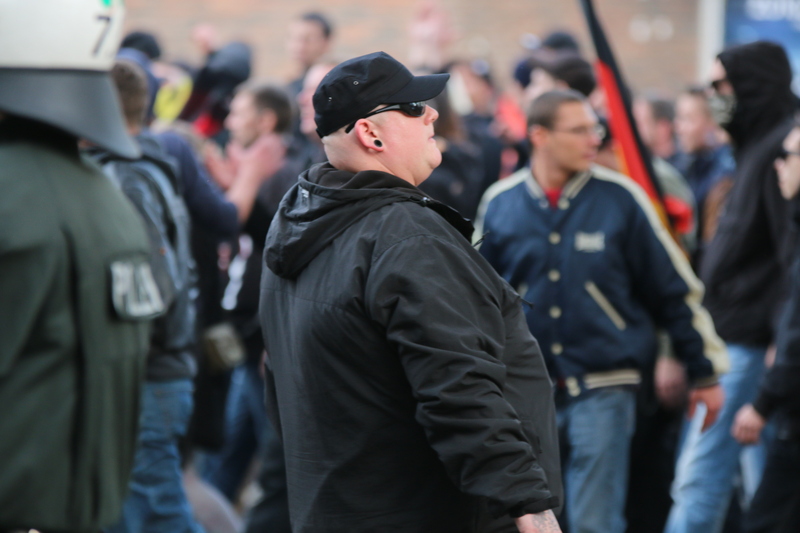 Here are some more nazis who rallied in Hannover…. Antifascists visited one of the meeting places of the fascists in Hannover, it was a visit they will remember. Though the police announced that 1,000 nazis will rally in Berlin on November 9, their organizers say the number will be ten times higher. Some state authorities considered banning the march of 10,000 nazis, though police reaction to them is tolerant when considered the brutality cops show towards antifascists. The explanation for this is that cops and the nazis share the same policies towards immigrants, who are the main targets of the nazis’ rallies, planned on November 9 in Berlin and November 15 in Berlin and Hamburg. The fascist The Right party announced they will participate in Hamburg on November 15. CDU deputy and AFD member announced they will join the neo-nazis the at a rally in Thuringia, to take place also on November 9. On November 9 the nazis plan a pre-gathering, before the official demonstration takes place. One of the main organisers of the Berlin rally on November 9 is a well known fascist, Steven Koek. Here’s a video with him, where he also does the Hitler salute which is banned in Germany. This is Nicole K: NPD, anti- foreigners; and promoted the fascist Third Position. This is Michael H: dentitary movement, Pro NRW, AfD, FPÖ, marine Le Pen, German Defence League. These are the “concerned, non-political citizens” of “HoGeSa” and just a look at their political positions indicates this “apolitical” movement is actually deeply fascist. Some christians are regarded as heroes when they say in their groups, “people get up and storm break off!”- this is an original word by word quote from Joseph Göbbels, who initiated the “total war”. Nearly all people in their group liked it. Another participant, Pascal, posted “on the 9 November storm the Bundestag”. Random date? Unlikely. It is the date of the Reichskristallnacht in 1938 in which mass synagogues were set on fire and Jews were massacred in what signaled the official beginning of the state policy of extermination of Jews. “Each region has its Regional Director and one alternate. The northern group includes Schleswig Holstein, Hamburg, Lower Saxony and Bremen. In the northern group is “CaptainFlubber” from the Bremen Regional Manager. The neo is organized at the “privateers Bremen” and has close contacts with other neo-Nazis, as well as to the band “Category C” and the “Farge Ultras”. His deputy is the well-known neo-Nazi Christian Sternberg from Lüneburg. Sternberg is operational since 2009 the neo-Nazi Laden “Hate Core Lüneburg” and is currently responsible for the merchandise like stickers and clothing “HoGesa” -North. Next support is the northern group of Sven Reichert from Bargstedt, which can be found as early as 2006 on the list of NPD for the council. At that time he was with Heike Dammann and still holds good contacts with neo-Nazis in Hamburg. There are “Whatsapp” groups for almost all cities. Benjamin “Benny” Kruger directs the group for the North. Furthermore, there is a treasurer for each region. In the northern region “Svener Potas” from Rostock is responsible. In Hamburg is planned a demonstration of the “HoGeSa” by Benjamin Kruger for November 15. First, the demo of the star jump was logged in to the main train station; 5,000 participants are expected. The locations of the start and the march route are certainly not chosen by chance, but must as a provocation against antifascists, Lampedusa refugees and migrant-dominated community in Hamburg. A few weeks ago, heavily armed IS-trailers attacked several people in front of the Kurdish center near the central station. Since then, some politicians and neo-Nazis exploit this attack for racist incitement and increasingly demanding repressive measures. Even if police ban the demonstration, the neo-Nazis will still come to Hamburg on November 15. Already now, neo-Nazis from all over Germany and from other countries announced they will come, same did the NPD Hamburg and the extreme right-wing band “Category C”. Touted have next to right football fans (including neo-Nazi hooligans and groups from Braunschweig, Leipzig and fans of FC Schalke 04) and fellowships as “Ag Weser mountain country”, “Ag North Heath”, the “White Wolves Terror Crew” (WWT- Hamburg, East and “Helvetia “),” Brigade 8 “and fraternity, on supporters of” identitarian movement “, neo-Nazi skinheads and groupings such as” skinheads Uelzen “,” Blood & Honour “Netherlands. Furthermore, are to be expected all members of extreme right-wing parties like the NPD, The Right and “The third way”, as well as the right-wing populist party AFD. On social networks, the neo-nazis they make hundreds of calls to violence; they want to destroy the asylum accommodation social center Rote Flora and other left-wing organizations, and fantasize to take “Antifa to be beheaded”. Andreas Schacht was also present at Cologne; this neo-nazi from “Cultura Germanica” has planned for November 6 a demonstration against the refugees in Hamburg. Meanwhile, an ultra rights group from Lok Leipzig has dissolved.